When did the Sioux first meet Europeans? In the 1500s and 1600s AD, Sioux people were still living around the Great Lakes (modern Minnesota). That’s where they were in 1667 when they first met French fur traders. When did the Sioux move to the Great Plains? But by the 1700s the Sioux (you pronounce it SOO), along with the Cheyenne and the Arapaho, had left their home to live on the Great Plains instead. That was further west, in modern North and South Dakota and Minnesota. Why did the Sioux leave the Great Lakes? The Sioux moved to the Great Plains mainly because their neighbors forced them to move. Beginning in the early 1600s other Native people, the Ojibwe and the Chippewa, pushed the Sioux out of the Great Lakes area. These Natives had been pushed out of their own land further east by European settlers. Thanks to their earlier contact with European traders, the Ojibwe and Chippewa had guns. But the Sioux didn’t have guns yet. The Ojibwe and the Chippewa used their guns to win battles against the Sioux. When did the Sioux get horses? 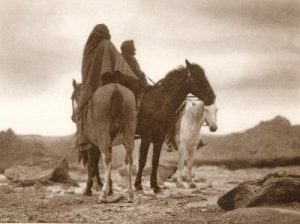 Another reason for the move west was that about 1730 the Sioux got horses from the Cheyenne. By 1750 AD, the Sioux turned around and used their horses to push out the Cheyenne and the Kiowa and the Mandan. The Sioux rode their horses and hunted bison all over the Great Plains. Whose side were the Sioux on in the American Revolution? The Sioux supported the British against the Americans in the Revolutionary War in the late 1700s, because the British promised to stop English settlers from moving west. But after the war the Sioux made a series of treaties with the Americans. Life on the Great Plains didn’t work out. By about 1850 AD people realized that this new system of hunting bison with horses also had a bad side. Living so far north, where there were long cold snowy winters, it was hard to find enough grass for the horses to eat during the winter. Sioux people found that the horses could survive by eating the bark of cottonwood trees. These trees grew in the valleys alongside rivers. So that’s where Sioux people took their horses in the winter. But that’s also where bison usually went to spend the winter. The valleys protected the bison from the worst of the cold weather and snow. When people and horses were in the valleys, the bison were afraid to go there. Many bison died from the cold and snow, up on the high plains. 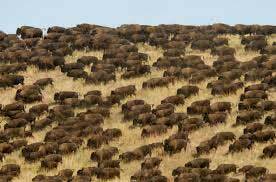 Between the unintended damage to the bison herds and the Sioux hunting the bison in the summer, by 1850 there were fewer and fewer bison around. Also, European people built the first railroad across the Great Plains at this time. The railroad frightened the bison and made it hard for them to travel on their usual migration routes. The Sioux began to go hungry. Now that the train was coming through, a lot of Europeans wanted to take over the Great Plains for themselves, to farm it. With irrigation, they could grow lots of corn there. They could ship the corn back to the East Coast cities on the trains. These Europeans realized that if they killed the rest of the bison, the Sioux would starve. The Sioux would have to do whatever the European people wanted in exchange for food. 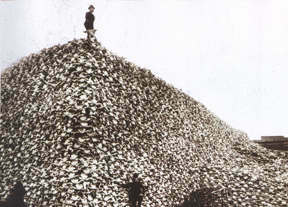 A pile of buffalo skulls waiting to be made into fertilizer. Courtesy of the Burton Historical Collection, Detroit Public Library. So that’s what they did. They killed almost all of the bison, just leaving them there to rot. And by the 1860s many Sioux had died and the rest were desperate. In 1862, Sioux warriors killed more than 800 white settlers in Minnesota. After the Civil War ended in 1865, the United States was happy to send a lot of soldiers West to fight the Sioux (and the Navajo). So things began to get even worse. In 1868, the United States army signed a treaty with the Sioux. The treaty said that the United States would never let settlers move into the Black Hills. The Black Hills would always belong to the Sioux. Mount Rushmore – Fifty years after the Army forced the Sioux out of the Black Hills, the United States carved the Presidents into a cliff there. But when explorers found gold in the Black Hills four years later, the United States broke that treaty. There was a big battle over this – the Battle of the Little Big Horn – and the Sioux won, under their great chief Sitting Bull. 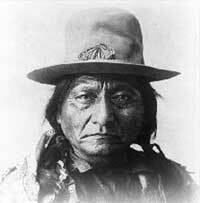 Sitting Bull was a Sioux leader. At the Battle of the Little Big Horn, the Sioux killed many United States soldiers, including General Custer. But winning the battle didn’t help. There still weren’t enough bison, and there were more and more United States soldiers. In 1889, many of the Sioux turned to a new Christian idea of the Ghost Dance. They thought the Ghost Dance would protect them against their enemies. But all that happened was that United States soldiers came and killed Sitting Bull. And more Sioux were killed at the Battle of Wounded Knee in 1890. 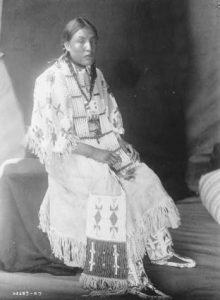 By 1900, all Sioux people were living on reservations, under the control of the United States government. 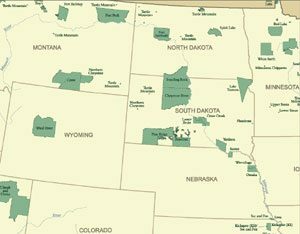 During the 1900s, most Sioux lived on a large reservation covering about half of South Dakota and large parts of Nebraska, North Dakota, Wyoming, and Colorado. Many Sioux people still spoke their own language. Sioux people began to farm corn and raise cattle, and to work towards a tourist industry. They’re still doing those things today, though they’ve lost even more of their land. Today, most Sioux people are poor, and have bad health care and bad schools. That’s because even though the United States forced them to become U.S. citizens, it doesn’t take care of them the way it takes care of white citizens. And check out this great comic book about Sitting Bull from a talented 8th grader at Rumble Comics! Cite this page: Carr, K.E. Sitting Bull and Wounded Knee – Sioux history. Quatr.us Study Guides, August 14, 2017. Web. April 26, 2019.